Unfortunately today came the day when we had to part ways. Louis continues north, then back east along the northern coast towards Belfast. He’s planning to be home next Saturday. It’a amazing that after 4 days and over 1700km he’s not half way through the trip yet. A real long way round. 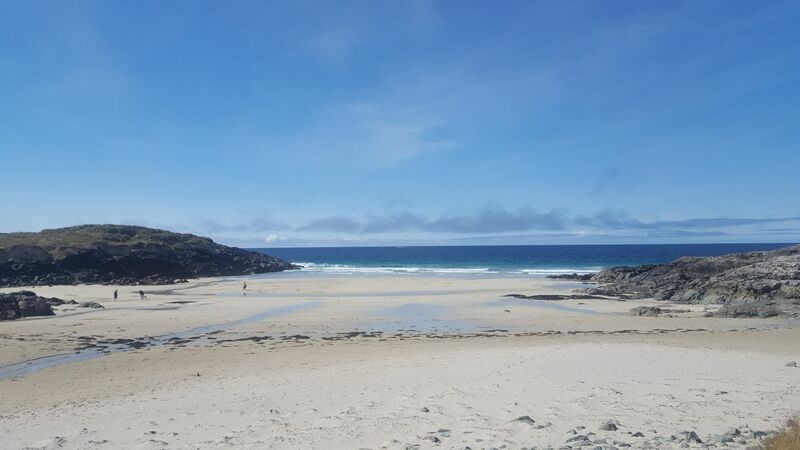 Ballyconeely beach. Lone rider continues his trip! Dave and I had to go back to Dublin. We live 10 mins away from each other but returned separately. I opted in for early start. Got up at 7 and by 8.30 was already on the M6 back to Dublin. The goal was to be home before major traffic hit the roads. It’s a very long weekend in Ireland. A lot of people will be coming home today. It took around 2 hours. The motorway is great for fast travel, but it’s suuuper boring. Nothing to remember really. I did a quick stop in Athlone to put on another layer, as it was pretty cold today. Probably the coldest I’ve been during that trip. 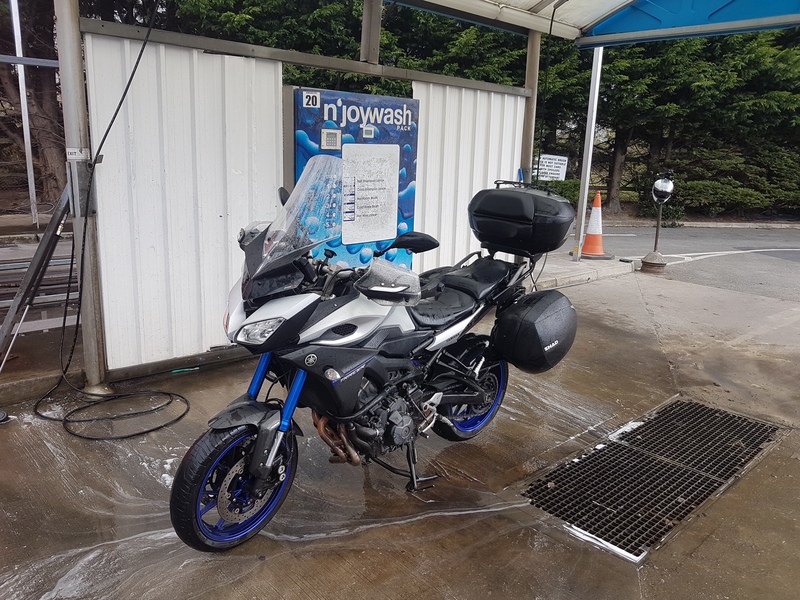 The first thing I did upon arrival home was to unload the contents of the panniers and hit my local service station for a proper scrub. I tried to ring up some of the local bike shops to see if they’d be opened today (I had almost all of the day ahead of me free, perfect for an oil and tires change), but It’s Easter Monday – everything is closed. I’ll have to make a visit tomorrow. 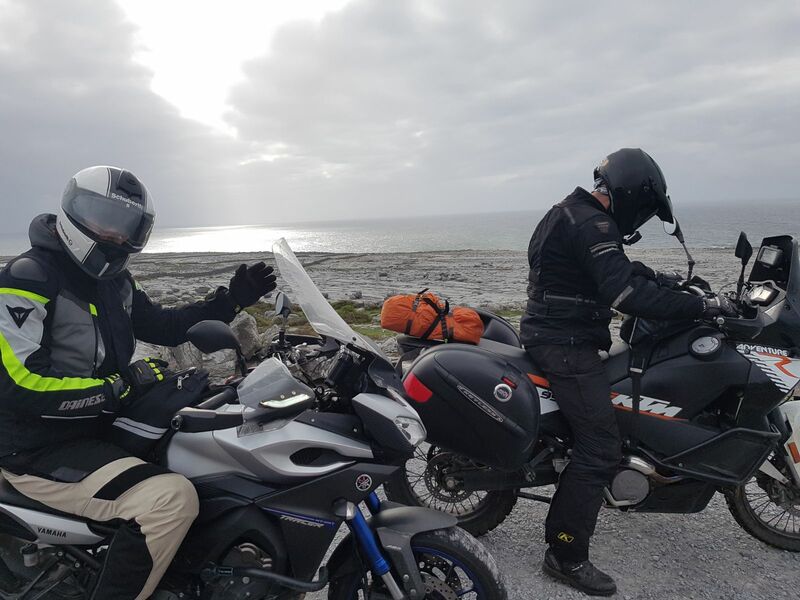 Dave in the mean time was making nice progress home, with a pit stop at his auntie’s in Roscommon (it’s a slightly different route, hence we didn’t go together). I got a message from him later that he also made home safe. I will remember these 4 days for a long time. It was a great adventure with a great company and some special moments. I’ve learned a lot (I’ll write about it more soon) and will definitely come to do the other half. Hopefully it will be later on this year!